Smoke coloring an evening sky tells of wildfire on the move. 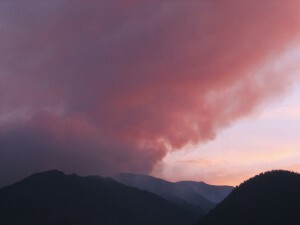 During a bad fire season in the mountain West, smoke, especially the smell of it, is a constant presence. Sometimes you forget, but all you have to do is step outside, trade house air for what lies beyond your door, and awareness comes rushing back. The wildfires of 1910 were terrible. Millions of acres burned. Towns were destroyed. Close to a hundred people were killed, most of them firefighters caught on the mountainsides and in the creek bottoms of Idaho. The story of that fire season formed the very real backdrop of my novel The Big Burn, and Timothy Egan would tell it in his non-fiction book of the same name that lies behind the new PBS American Experience series special, The Fire that Changed Everything.